Super Fat Burner is a very good weight control product. It contains only lipotropic ingredients, which makes it very suitable for people who cannot work out on a regular basis but want to be fit. It gives you an additional incentive when you are on a diet and improves the results of it. 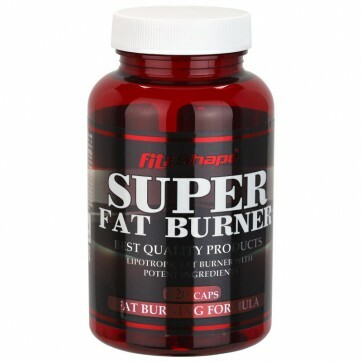 SUPER FAT BURNER contains B vitamin complex, which keep you fresh and focused on daily tasks while losing weight. DIRECTIONS OF USE: Enhances fat metabolism, weight control and fat burning. Take 4 capsules during the day before meals. 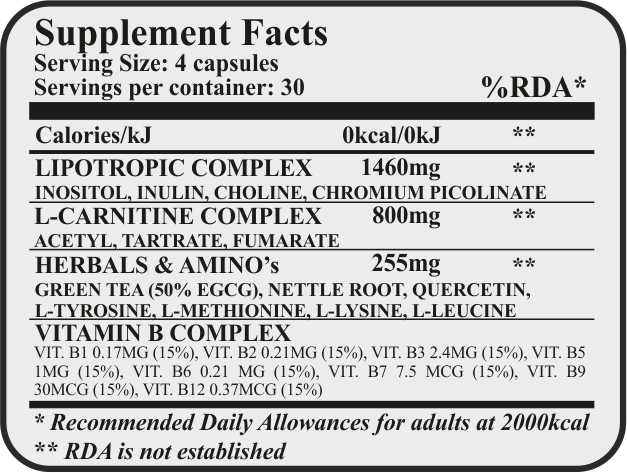 On workout days, take 1 capsule before breakfast, 2 capsules 30 minutes before workout and 1 capsule before dinner. INGREDIENTS: L-carnitine, choline, inositol, inulin, green tea, nettle root, quercetin, L-Tyrosine, L-Lysine, L-Leucine, L-Methionine, B vitamin complex, chromium picolinate, hard gelatin capsule.